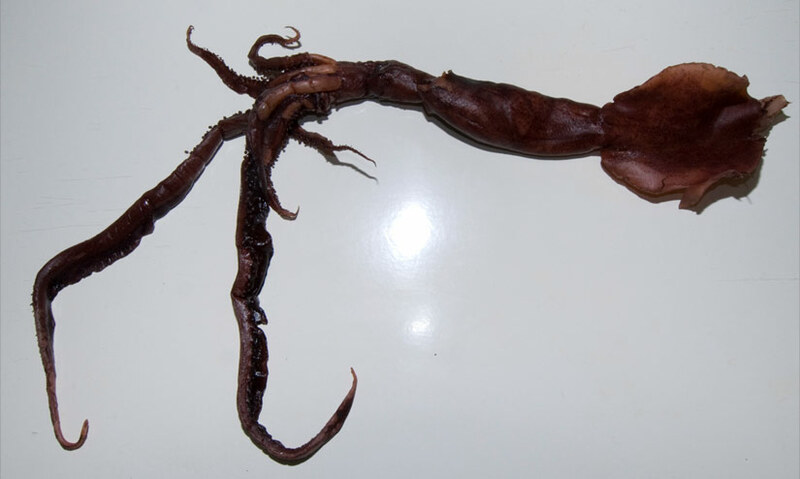 A new large species of squid has been found among 70 types gathered during an exploration of the depths of the Indian Ocean, according to the International Union for the Conservation of Nature. The 27-inche-long species is part of the "chiroteuthid" family. Its light-emitting organs attract prey in the darkness thousands of feet down, close to the craggy seabed, the IUCN said. The six-week "Seamounts cruise" last year trawled about 7,000 samples of life forms in the southern Indian Ocean from depths of up to 3,936 feet. “For 10 days now, 21 scientists armed with microscopes have been working through intimidating rows of jars containing fishes, squids, zooplankton and other interesting creatures,” said Alex Rogers, marine biologist at the Zoological Society of London.